While at my folks’ for the weekend, I ended up diving into the free streaming service Dish Network has to offer, in search of the Maze Runner movies. Unsuccessfully, as it happened, but while plumbing the depths of the “action movies from 2010s” section (since they don’t seem to have a search function), I stumbled across Minty: The Assassin, which probably was a mistake. Minty (and the other characters) are comic book characters who exist in real life in the world that writes comics about them. This is not really a new idea; it pretty much lines up exactly with how Marvel has always run its comics division, for example. Anyway, after a series of really inexplicable vignettes in which we are introduced to Minty (her power is like Popeye, except she eats chocolate), her vampire potential girlfriend, and her mentor Big Boss, the meat of the movie begins when Big Boss is kidnapped by a psychic surgeon and used as bait to lure Minty to his tower. She fights her way up the tower past various colorful level bosses, losing bits of clothing as she goes, only to discover (okay, spoiler alert I guess, but seriously, don’t watch this) that it was all a set-up. The point of the kidnapping was to get her naked to the top of the tower, because Dr. Brain Bender is actually a creepazoid fan of her comic, and he wanted to see her with her clothes off. Leaving aside the inherent contradiction of stripping her down in pursuit of an anti-sexism plot, the movie nevertheless had the germ of a good idea there. He’s clearly a bad guy, and he’s clearly a crazy loser, and you can at least imagine someone taking the message to heart. ….except that the final 15 minutes is exploitative in the extreme, of the characters and the audience alike. The fact that the bad guy gets assassined in the end really doesn’t make up for how sleazy the path to his death was. This entry was posted in Film and tagged action, comedy on January 15, 2018 by Chris. A year late, right? Summary, in case you’re as far behind the curve as I am: A mixed race 20-somethings couple visits the lady’s white family’s estate out in the boondocks (or, as you call it when you’re rich, “by the lake”), and the dude feels less comfortable / more out of place with every passing hour. Especially once the annual reunion gathering thingy kicks into gear. 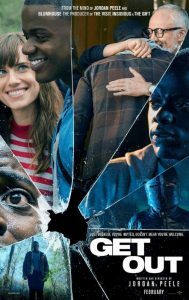 I wish I could say that the year of knowledge that Get Out existed and of the largely untouched niche it occupied was the reason I found it so predictable, but that’s not it. The truth is, the plot developments I guessed as the movie progressed, I would have been able to guess last February if I’d seen it then at the drive-in, as God intended. The good news is, that’s not really a flaw of the movie. When you are writing a horror movie as social commentary, it is understood that you amplify the fear you are exploring. And (he said, without meaning to appropriate anyone’s experience so much as simply to agree with the portrayal here) the black man’s fear of being the outsider / his fear of the white man broadly in general is not a genre that has been explored particularly thoroughly. Anger, displacement, revenge fantasies? Sure, since the heady blaxploitation days of the 1970s. But actual fear? Not so much. What makes me sad is that the kind of people who see nothing wrong with being afraid of walking through the so-called ‘hood will probably not ever have seen this, and would probably roll their eyes at how over the top ridiculous the movie is, if they did see it. Like I said: over the top is the point, and it doesn’t detract from very real fear. It just casts a light upon it, to make it easier to see. Also, though, the scene with the flashing cop car lights was by far the most frightening-to-me thing that happened, and there’s nothing exaggerative in that scene at all. I’m not sure this properly is a horror movie, and my tag reflects this, but it’s certainly close enough to go on with. This entry was posted in Film and tagged suspense on January 8, 2018 by Chris. 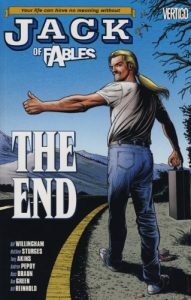 The final volume of Jack of Fables is hard to review for two reasons. If I’m being honest with myself, the series had outstayed its welcome since probably the big crossover, or at the very latest whichever book after that involved the dragon. So for my perspective: I’m glad it’s over. But that’s an opinion, not a review. Reason one why The End is hard to review: because it’s not only the last entry in a series, but also the ninth. So, spoilers galore. This is a common problem that I have, and the lesson I suppose is to read more standalone stories? Reason two why it’s hard to review: because anything I actually would be willing to say is already covered by the title itself. This book right here? Delivers on its promise. So, what else even would there be to say? Was it satisfying? Since I was already done with these characters, one of them probably before he ever existed, it’s hard to answer that in true fairness. But yes, I’m satisfied. ….except for the perpetual Walter Mitty miniaturized blue ox. I never got that at all. But I’m glad I will never have to worry about it again, at least! This entry was posted in Words and tagged fantasy, graphic novel on January 8, 2018 by Chris. 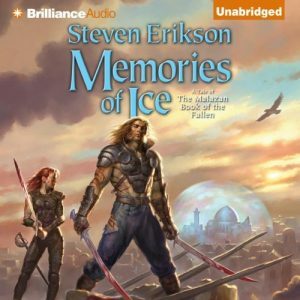 My original review of Memories of Ice is really terrible, and it should not be read. I liked the story, and that part is still the correct opinion, but man is the review a rambling mess. I apologize. But, I have now listened to that book again, as part of my ongoing reread (and eventually new read) of the entire series, and: seriously, this is an incredibly good series. With an incredibly good reader in Ralph Lister, so naturally he did these three books and then stopped. I do not want to have to get used to someone else! Anyway, what can I say about the book that is not a spoiler but that also redeems my original review? Man, I dunno. I was definitely interested in the way this and Deadhouse Gates paired with each other, and wonder if anyone has provided a way to read them simultaneously. I mean, interleaved with each other such that the events on different continents are occurring in more or less chronological order. This would be a terrible way to first read them, as they each are so self-contained, but the occasional ways they interact are a lot more meaningful to me during this reread, while I have a decent idea of what’s going on overall. As last time, the things I cared about were very different upon the revisit. Every scene with Itkovian or with the T’lan Imass was riveting, and every scene with Lady Envy was drenched in snickers. Even the ones that should have been maybe serious? But mostly, I found that this is very nearly a self-contained trilogy, and definitely a good one. Among my favorites, though that’s easy to say when so few exist. I’m getting towards the part of the story where I remember less about how things are. So that will be interesting? 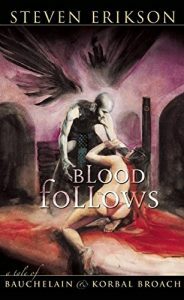 This entry was posted in Words and tagged epic fantasy, The Malazan Book of the Fallen on January 4, 2018 by Chris.